Posted by DustinRJay in stocks. Both Canadian and American real estate investment trust indices have performed extremely poorly over the past three quarters. Canadian real estate investment trusts are down roughly 25% from peaks in early 2007. This is very similar to the performance of US real estate investment trusts. 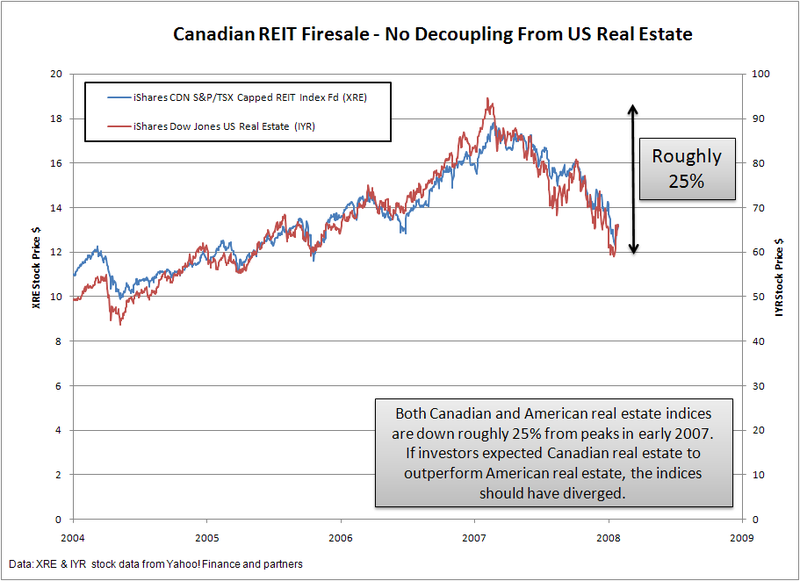 If investors expected Canadian real estate to outperform American real estate, the indices should have diverged. One possible reason for the repricing of Canadian REIT’s is that both Canadian and US real estate prices have roughly doubled since 1995 and this has raised the same concerns of overvaluation that are present in the US markets. You are comparing apples to oranges. Fix your graph to price the canadian index in US dollars and it will paint a different picture. Canadian REIT Index outperformed U.S. REITs (albeit with negative total returns), returning -5.7% versus -16.4% in 2007 for the S&P U.S. REIT Index in U.S. So yes there is decoupling….. I disagree Pete, you would then be examining the performance of each REIT relative to the USD…the US one is already priced in USD, but the Canadian one is skewed. If you want to compare purely the behavior of the trust itself, I think this way is the proper way to look at it, in this context. Now, if you were a big, international investor, you would certainly be interested in both versions. But for the purposes of this post, I think radley77 is right. It would make sense to me, a REIT is more liquid than real estate itself, so it should be a leading indicator….although its strange that there is no lag whatsoever on the Canadian chart. Why not benchmark the performance on a Canadian dollar basis, since we are in Canada? Both indices would have still dropped 25ish% from peaks, except if you had US REIT holdings you would have lost an additional amount due to the depreciation of the US dollar. Typically foreign exchange rate fluctations are examined independently of any kind of stock valuation analysis (just as you have done above). Foreign exchange rate fluctuations do not make the case that Canadian and US REITS have decoupled. You’re also comparing a Canadian REIT index to a US Real Estate Index. Again not apples to apples. I just pulled the S&P U.S. REIT Index (US$) and it was down 20.2% in 2007 compared to the S&P/TSX REIT Index (C$) which was down 10.8%. If you’re on bloomberg pull the monthly REIT reserach report from CIBC World Markets they go on how the markets have diverged. I don’t have time get into details here but they consider Canadian REITs to be “safe havens” compared to US REITS. In my opinion as a native Calgarian, I have to agree with Radley and Trevor. I feel this is a Macintosh to Granny Smith comparison for sure. The correlation between these two indices are very tight and make perfect sense to the above argument. I will be following Radley’s blog from now on as I am interested in his analysis to come. He appears to be very well versed in the marketts our our city. Just came across the blog today, it’s fantastic. Like the previous commenter, I live in Calgary and I have to agree with what you are saying. Thanks for the blog, I will be checking regularly. The media doesn’t tell the truth about the realestate market due to the fact that they have huge advertising accounts with realtors, banks, developers ect. ect. Your blog is great more people who may be considering buying a house should research a little more instead of relying on the pablum they are getting spoon fed by people whose vested interest is to sustain a bubble no matter what the cost. In Fort Saskatchewan, 12 miles north of Edmonton, developers are backfilling basements they dug last summer because they can’t unload the houses they finished last spring. It sure doesn’t look like we have decoupled from the US market. Relocating back to Knoxville very soon, and although I don’t expect that I will be able to buy a nice little farm right off the bat, I’d like to get a handle on the small farm/acreage market in the area. I can’t seem to find a lot out there. Am I looking in the wrong place? Resources?